Images have never been as freely circulated as they are today. They have also never been so tightly controlled. As with the birth of photography, digital reproduction has created new possibilities for the duplication and consumption of images, offering greater dissemination and access. But digital reproduction has also stoked new anxieties concerning authenticity and ownership. From this contemporary vantage point, After Uniqueness traces the ambivalence of reproducibility through the intersecting histories of experimental cinema and the moving image in art, examining how artists, filmmakers, and theorists have found in the copy a utopian promise or a dangerous inauthenticity-or both at once. From the sale of film in limited editions on the art market to the downloading of bootlegs, from the singularity of live cinema to video art broadcast on television, Erika Balsom investigates how the reproducibility of the moving image has been embraced, rejected, and negotiated by major figures including Stan Brakhage, Leo Castelli, and Gregory Markopoulos. 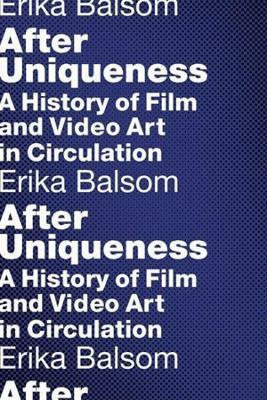 Through a comparative analysis of selected distribution models and key case studies, she demonstrates how the question of image circulation is central to the history of film and video art. After Uniqueness shows that distribution channels are more than neutral pathways; they determine how we encounter, interpret, and write the history of the moving image as an art form. Erika Balsom is senior lecturer in film studies and liberal arts at King's College London. She is the author of Exhibiting Cinema in Contemporary Art (2013) and the coeditor of Documentary Across Disciplines (2016).